Bridge for a Mammoth(8x10 $SOLD!) Fun little mammoth study, with more cool enviroment around him. 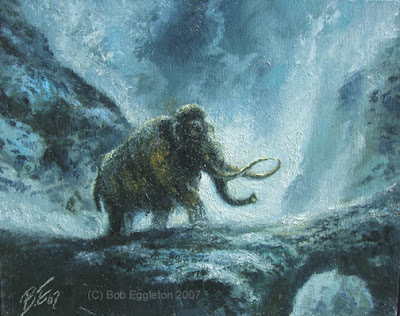 It's so cold, the thoughts of mammoths are not far away!!! This came out nicely textured as well, I was quite happy with it. Fantastic! I've always had a fondness for cold blue color schemes. The little bit of warm color in the mammoths fur really strengthens the impact. I wish more of the top artists in the SF and fantasy field would start a daily painting blog. Its great to see something besides still lifes of marbles and fruit from a daily painting blog. David-Thanks! I intend to do a major Mammothian painting and, these are great work ups to that. This was alot of fun. More mammoths soon. And more "fantastical" works to come. I think I have found my space here. Even a few of my kind of mundane still lifes have found homes and will continue to do so. Not to say I don't like still lifes. I do them myself fairly often. One just likes to see a little more variety in the world of daily painting blogs. Another wonderful mammoth and a delightful ice age type background. Really gives you a feel for the life of such creatures. I want to paint more and, bigger too. These work as little work ups for what I want to do on a bigger scale.